Sheinbaum, an activist for nearly 70 years who was slammed for meeting with Palestinian leader Yasser Arafat in Tunisia in 1988, died Monday at his Los Angeles home. He was 96. 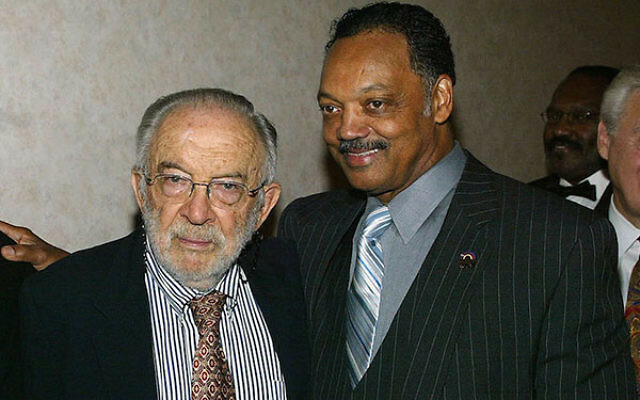 “Like a modern-day Forrest Gump – albeit one with a Phi Beta Kappa key – Sheinbaum has witnessed history up close and personal, leaving his thumbprints all over some of the defining moments of the past half century,” the Los Angeles Jewish Journal reported in a 2004 profile. Sheinbaum served as acting Los Angeles police commissioner in the early 1990s, leading the successful fight to oust Police Chief Daryl Gates over the police beating of African-American taxi driver Rodney King, the Jewish Journal reported. He also led a controversial delegation of American Jews to the Middle East to meet with Arafat in Tunis and convince him to publicly renounce terrorism and recognize Israel’s right to exist. Large segments of the Jewish community and leadership excoriated Sheinbaum as a traitor; a dead pig was deposited on his driveway. Sheinbaum also fought for divestment from South Africa as a University of California regent and raised nearly $1 million for the successful defense of Pentagon Papers principal Daniel Ellsberg. That position was a long way from his birth in New York City. The son of a leather goods manufacturer who went bankrupt during the Depression, a young Stanley tried to help the family by selling magazines, working as a delivery boy and clerking in a department store. He had no interest and had deplorable grades in high school, Sheinbaum recalled in his 2012 memoir. Its title, “Stanley K. Sheinbaum: A 20th Century Knight’s Quest for Peace, Civil Liberties and Economic Justice,” might also serve as a one-sentence summary of his life. After six years in the Army during World War II spent mainly making maps, Sheinbaum applied for admission to 33 colleges but was rejected by all of them due to his failing and incomplete high school grades. At 26, Sheinbaum went back and completed high school, then went on to graduate from Stanford University with highest honors as an economist. He won a Fulbright fellowship to study international monetary affairs in Paris.